The team at Anthony Spink Dental Suite provides high-quality dental care with a modern touch. We believe in preventative dentistry and a conservative approach to care, restoring and protecting your teeth whenever possible. 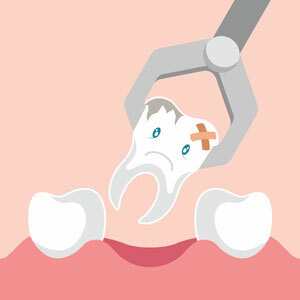 Occasionally, it may be necessary to extract your tooth if it cannot be saved by options such as a root canal or crown. In such cases, we can perform the extraction on-site. A tooth may require extraction if it has decayed extensively. The other most common cause is a trauma that fractures the tooth. Under such circumstances, removing the tooth may be advisable. It’s a common dental procedure and doesn’t need to be considered painful. The extractions performed at our practice are quick with minimal aftercare needed. We’ll perform a comprehensive evaluation to ensure that an extraction is your best possible option. Your history will be carefully reviewed to make sure it is appropriate for you. Then, local anaesthesia is applied that allows you to stay comfortable during the extraction. Your dentist will see how much you can feel to be sure that you’re numb before proceeding. If you wish, you can have someone drive you to and from your appointment, though it is not necessary. Apply gauze. It’s normal if the extraction site takes some time to heal. If necessary, gauze can be put on the area and replaced regularly. Avoid brushing. Though the rest of your teeth still need attention, don’t brush the extraction as it will disrupt your healing. Do not rinse. For 24 hours afterwards, avoid rinsing your mouth. On the second day, a mild salt solution can be used to gently wash the extraction site. Eat soft foods. For one to two days afterwards, having foods like mashed potatoes, soup or milkshakes may help the extraction site to heal quickly. Get some rest. Though we have busy lives, it’s important to give your body time to heal. Rest, recuperate and avoid strenuous activities. Take Ibuprofen. If you prefer another type of painkiller, check with your dentist to be sure it’s appropriate, as we do not recommend aspirin. It thins your blood, and we aim to have your empty socket clot as quickly as possible. We’ve found that one of the best ways you can beat dental anxiety is by being well-informed. We’ll answer all your questions and explain each step of the way to you so that you can proceed with confidence during your routine extractions Brighton. We take a gentle approach to our dental care to ensure your comfort. Contact us today to schedule your appointment! Health funds are accepted and we are providers for HBF, MDF and Medibank.